What Is the Cause of Cholera? How Does Cholera Spread? What Are Cholera Risk Factors? What Are Symptoms and Signs of Cholera? What Is the Incubation Period With Cholera? How Long Is Cholera Contagious? What Types of Doctors Treat Cholera? What Tests Do Doctors Use to Diagnose Cholera? What Are Treatment Options for Cholera? What Are Complications of Cholera? What Is the Prognosis for Cholera? Are There Cholera Vaccines? How Can People Prevent Cholera? Cholera is a highly contagious gastrointestinal infection caused by the bacterium Vibrio cholerae. Cholera is endemic in most countries, but disease does not occur in industrialized countries with water and sewage treatment systems. Cholera is a product of poor sanitation and lack of proper water treatment, so it occurs in areas of poverty, areas where disasters or war have disrupted social structure, and where refugees have concentrated in camps with poor water sanitation and sewage disposal. Cholera is transmitted by contaminated food or water. Worldwide, up to 140,000 die yearly due to cholera. Cholera cases have increased since 2005. It still occurs in many places, including Africa, Southeast Asia, and Haiti. Sub-Saharan Africa remains most often affected by cholera and suffers the highest death rate because of poor access to water, sanitation, hygiene, and basic health-care resources. Southeast Asia has had increased cases due to flooding, dense population, and lack of clean water, sanitation, and hygiene resources. One of the worst outbreaks in recent history began in Haiti in 2010 in the year after the catastrophic earthquake that left 200,000 dead and over 1 million people homeless. Despite rapid response and control by public-health agencies, cholera cases are still occurring and will do so until water systems are adequate to prevent it. People who may be at risk for cholera include military personnel, humanitarian aid workers, missionary workers, and adventure travelers to such areas. Cholera is often severely debilitating and lethal because of rapid dehydration and lack of access to medical support. Because of high-volume diarrhea and a potent toxin, it easily contaminates water, and it often spreads explosively in outbreaks. 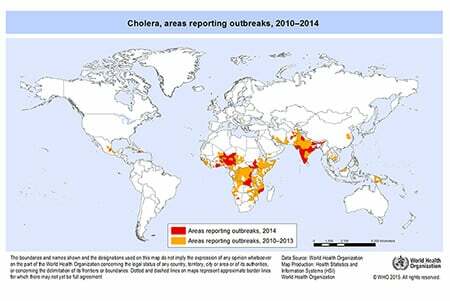 Despite high infectivity and ease of spread, prevention and treatment of cholera is relatively straightforward. Cholera is caused by ingesting the bacterium Vibrio cholerae. These bacteria produce a potent enterotoxin that forces the intestines to excrete massive volumes of highly contagious fluid until the illness runs its course. People are infected with it by drinking or eating contaminated water or food sources. Caregivers of those with cholera can infect themselves if they do not have access to effective hygiene. They can infect others if they do not properly dispose of waste and contaminated items. Up to 80% of people who are infected have mild symptoms but can shed bacteria in their stools for up to 10 days. Thus, cholera often becomes rapidly epidemic. Risk factors for cholera include care of someone with cholera, being in an area where cholera is epidemic, and being in an area with poor water treatment and sanitation. Cholera cases and epidemics are tracked by public-health authorities, such as the World Health Organization and Centers for Disease Control and Prevention. Cholera may be asymptomatic or mild, but 20% develop the classic uncontrollable watery diarrhea, often so severe that the stool of a victim is almost clear and does not stop. The classic appearance is called "rice water stool." Nausea and vomiting also occur, but there is usually little abdominal pain or cramping. If the victim cannot drink enough fluid and electrolytes to replace the loss, they will die from complications of water-electrolyte imbalance (imbalance of body sodium, potassium, and pH). Extreme loss of water also causes life-threatening low blood pressure and shock ("hypovolemic shock"). Other than severe diarrhea, other signs help determine the level of dehydration and whether shock is present. Early symptoms of dehydration include thirst, dry mouth, weakness, and leg cramps, progressing to more advanced symptoms and signs with fast heart rate, drop in blood pressure or fainting upon standing up, and insufficient urine production. A person who is severely dehydrated may have a sunken appearance to the eyes, loosening of the skin, and weight loss; they may develop sleepiness and be difficult to arouse. These are important signs of impending shock, at which point the person will become unresponsive and may develop mottled purple blotches of the extremities. The incubation period (the time between ingestion of the bacterium and the start of symptoms) is very short, from two hours to five days. Cholera is contagious for as long as there is watery diarrhea. Most cases of cholera occur in areas with poor resources for health care. Thus, those who treat cholera may be primary-care doctors or general practitioners, pediatricians, nurse practitioners or physician assistants, nurses, military medics, humanitarian aid workers, or any caregiver trained in treating cholera with oral rehydration fluids. Usually, specialists such as gastroenterologists or infectious-disease specialists are unavailable. Fortunately, cholera does not require highly technical treatment, and an epidemic can be stopped by rehydration of victims and establishing basic sanitation. Those who may be exposed may consult a specialist in infectious diseases or travel medicine for advice, preventive medication, or a vaccine to prevent cholera. Military personnel receive a cholera vaccine as part of preventive medical treatment. Typically, cholera is diagnosed by the pattern of symptoms, multiple victims, and evidence of "rice water stool." Stool cultures can be done if the diagnosis is unclear. Cholera does not require highly technical treatment, and up to 80% of victims survive if treated with rehydration. An epidemic can be stopped by rehydration of victims and establishing basic sanitation. Rehydration may be accomplished using simple oral rehydration fluid. This may be a product similar to commercial pediatric electrolyte solutions, but an effective oral replacement can be as simple and inexpensive as a solution of clean water with a small amount of sugar and salt. More severe cases of dehydration when a person cannot drink even small sips require IV fluids. Antibiotic treatment of infected individuals is also used to shorten the course of illness and the duration of shedding of the bacteria in stool. Effective antibiotics against cholera include tetracycline, doxycycline (Vibramycin), sulfa drugs such as trimethoprim (Primsol) and trimethoprim/sulfamethoxazole (Bactrim), ciprofloxacin (Cipro), erythromycin (Ery-Tab), and azithromycin (Zithromax). Education and awareness campaigns in epidemic areas permit early treatment of those infected, as well as establishing local prevention measures. Vaccination is an important tool in outbreak control. The World Health Organization stocks two oral cholera vaccines (Dukoral and Shanchol) that have been used successfully in mass vaccination campaigns. Mass antibiotic treatment is not used because it does not stop epidemics or the spread of cholera. It also leads to resistance to the antibiotics when they are actually needed. The complications of untreated cholera are mainly shock and death from massive fluid loss. Massive electrolyte loss can lead to lethal cardiac rhythm disturbances and seizures. Without replacement fluids, cholera is most often lethal in infants, young children, the malnourished, and the elderly. Yet if basic oral hydration and electrolyte replacement is available, the prognosis is good for surviving cholera. Visitors to cholera-affected and rural areas must pay strict attention to eating and drinking only uncontaminated food and water and to meticulous hand hygiene. Filtration and treatment of water used for drinking, washing, and food preparation and proper disposal of human waste prevents cholera and other infections such as typhoid or dysentery. In affected areas, outbreak control and long-term prevention requires education about community-level prevention measures of sewage disposal and water treatment, as well as personal measures such as hygiene and the use of home water treatment or filters. There are two oral vaccines prequalified by WHO. Dukoral (manufactured by SBL Vaccines) is given to adults and children over 6 years of age in two doses, and to children 2-6 years of age in three doses. Protection is provided one week after the last dose. The vaccine confers 85% protection for four to six months in all ages but is not licensed for use in children under 2 years of age. Shanchol (manufactured by Shantha Biotec in India) is given in two doses, two weeks apart for those over 1 year of age; children over 5 years of age do not require a booster dose. It provides 67% protection against cholera for up to five years. Because these vaccines offer incomplete protection, they do not replace standard prevention and control measures. In June 2016, the U.S. Food and Drug Administration granted fast-track approval to Vaxchora, a vaccine for the prevention of epidemic cholera in adults 18-64 years of age who are traveling to cholera-affected areas. Vaxchora is the only FDA-approved vaccine for the prevention of cholera. Vaxchora is a live, weakened-virus vaccine that is taken as a single oral liquid dose of about 3 fluid ounces at least 10 days before travel to a cholera-affected area. In studies, the vaccine was 90% effective in protecting against a live cholera challenge 10 days after vaccination and 80% effective three months after vaccination. The vaccine provides protective antibody levels in over 90% of recipients. Vaxchora is manufactured by PaxVax Bermuda Ltd., in Hamilton, Bermuda. Although cholera calls up visions of medieval plagues and can be a major cause of anxiety in tourists, it is really very hard to catch. The risk of cholera has been estimated at two cases per million travelers. Cholera is a problem in areas where significant amounts of human waste contaminate food or water. The level of contamination must be very high, because a large number of the cholera bacteria must be ingested to cause the disease. This causes the food to smell or taste so bad that few tourists are tempted to eat it. Occasionally, the foul taste is covered with spicy sauces. Raw shellfish have been a source of disease in some areas. Switzerland. World Health Organization. "Cholera." July 2015. <http://www.who.int/mediacentre/factsheets/fs107/en/>. United States. Centers for Disease Control and Prevention. "Cholera - Vibrio cholerae infection." Oct. 27, 2014. <http://www.cdc.gov/cholera/index.html>. United States. U.S. Food and Drug Administration. "FDA approves vaccine to prevent cholera for travelers." June 10, 2016. <http://www.fda.gov/NewsEvents/Newsroom/PressAnnouncements/ucm506305.htm>. Please share your experience with cholera. What treatment did you receive for cholera?